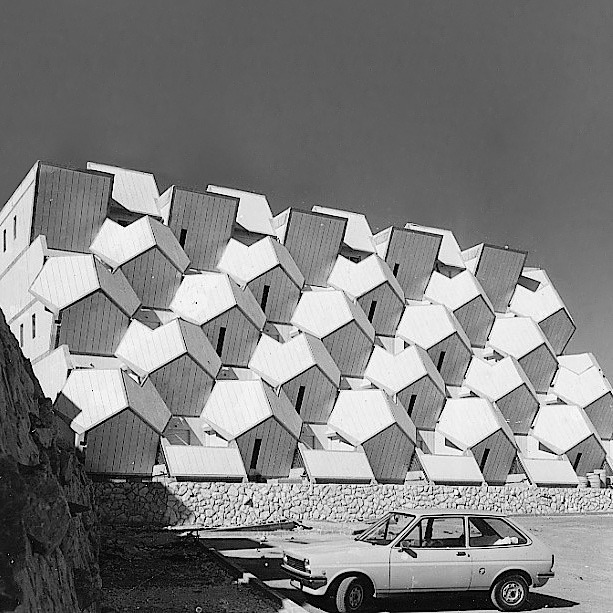 Commissioned following the Six Day War of 1967 with a need to house more families in new territories, Zvi Hecker was approached to apply his personal brand of repetitively arrayed forms and geometries to arrive at a new solution for high density housing. The Ramot Polin project took the dodecahedron as a single module, stacking and slicing for openings to provide a truly innovative morphology for living. A classic example of optimistic mid-century architectural experimentation, Hecker’s modules proved almost uninhabitable with tight, poorly lit spaces and awkwardly angled, unusable surfaces. Still standing, Hecker’s prisms have been transformed by their occupants over the years in the form of more conventionally rectilinear extensions, larger openings and the addition of air conditioning units through a process referred to as ‘creative coping’ by historian/architect David Kroyanker.